Hats, buttons & stickers for your ride! Some people & things are property of Gold's Gym, others may be harboring stolen property. 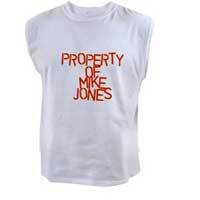 Either way, this shirt says "Property of Mike Jones." As MC Hammer would say... proper.